The Metro Ethernet Forum (MEF) is a global industry alliance comprised of more than 175 active members representing Carrier Ethernet industry groups. The forum develops technical specifications and implementation agreements to promote interoperability and deployment of Carrier Ethernet services worldwide. The ZyXEL MGS-3712F is aligned with carrier-class standards for Ethernet Private Line (EPL), Ethernet Virtual Private Line (EVPL) and Ethernet LAN (E-LAN) of Metro Ethernet Forum (MEF), and the Series has been certified as MEF-9 and MEF-14 compliant. Consistent service quality and reliable connecting ability in a converged network is the key for service providers to win customers and build loyalty; therefore the ability to control traffic flow and set traffic policy becomes more critical than ever. The MGS-3712F offers wire-speed flow control that classifies and prioritizes the incoming packets according to the predefine QoS policies that meet requirements of service providers. In terms of classification, the Differentiated Services Code Point (DSCP) field and the 802.1p class of service (CoS) field are identified to assess the priority of incoming packets. Classification and reclassification can be based on criteria as specific as rules based on IP, MAC addresses, VLAN ID or TCP/UDP port number. For bandwidth management, the MGS-3712F provides 8 priority queues per port for different types of traffics, allowing service providers to set rule-based rate limitations that take full advantage of constrained network resources and guarantee the best performance. Avoiding subscribers affecting each other on a shared network or shared device is a major concern for service providers. The MGS-3712F offers a complete set of security features to protect user data while administrating the traffics. The intrusion lock function detects the “plugged” and “unplugged” status change of Ethernet cables, and the switch would deactivate a specific port automatically if needed, and the 802.1X authentication can secure the network from unauthorized users. Port security provides the ability to deny unauthorized users from accessing the network. Moreover, the 802.1X feature cooperating with RADIUS is useful to prevent unauthorized access based on username and password (or other credentials) and acts as powerful access control for converged networks with mixed wired and wireless access. The MGS-3712F provides a multilayer (L2/L3/L4) ACL suite of sophisticated policy-based control mechanisms that enables service providers to deploy easily based on actual network environment needs via a Web GUI or command line interface to prevent abnormal or illegal access. The policies can be defined to deny packets based on source and destination MAC addresses, IP addresses or TCP/UDP ports. A quick recovery and round-the-clock network is vital for service providers to establish a robust network. 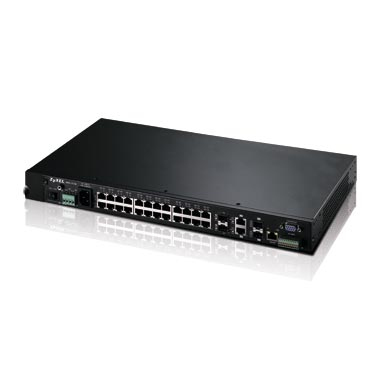 The MGS-3712F provides comprehensive features to make sure network is well operated. The IEEE 802.3ad Link Aggregation feature reduces network downtime by providing redundant paths and bandwidth aggregation to critical connections, while IEEE 802.1w Rapid Spanning Tree Protocol (RSTP) and IEEE 802.1s Multiple Spanning Tree Protocol (MSTP) allow immediate recovery from failed connections by sending packets via the backup link. Furthermore, since the MGS-3712F supports backup power system, the power is supplied to the switch in case of an unexpected outage. Fans play an important role in energy consumption since it’s the key to heat dissipation. The MGS-3712F features auto temperature detection and appropriate fan speeds with the Intelligent Fan Control algorithm based on complex mathematics and physics formulas. When the ambient temperature is low, the switch would decrease fan speed to prevent unnecessary power waste from excessive cooling. Removable fan modules provide flexibility and high availability, and they solve the noise problem when the modules are approaching the end of their life cycle. When necessary, customers can replace the fans with new ones by their own to save cost. The MGS-3712F offers high operating temperature tolerance, flexible AC/DC dual-input power source as well as protection against humidity and dust for service providers to extend their networks. The MGS-3712F adopts the “front access” design for technicians to easily wire and maintain outdoor cabinets. The external alarm input/output block connects mechanical cabinet parts to the management network and offers better protection to the equipment.